I don’t know how many times over the course of a week I see commercials on television for skin-care products that promise to combat the appearance of fine lines and wrinkles. Why can’t we accept the aging process as it happens or grow into ourselves naturally? 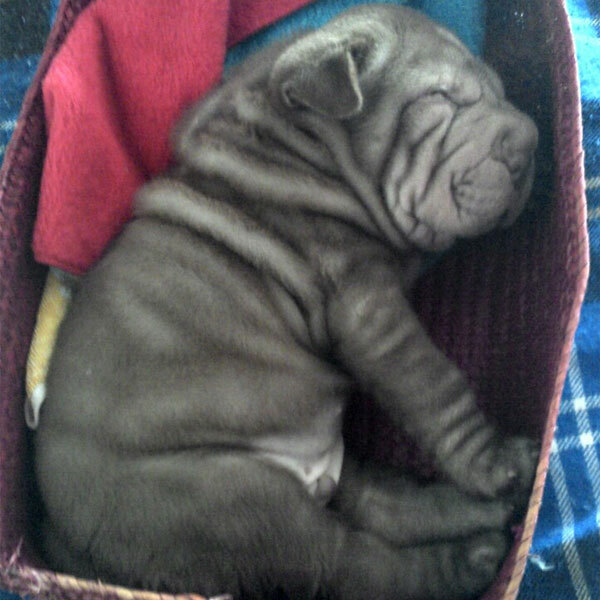 In the dog world, there are perhaps no cute puppy pictures that cause me to celebrate wrinkles as much as Shar Pei puppies! From a human point of view, Shar Pei puppies age in reverse. 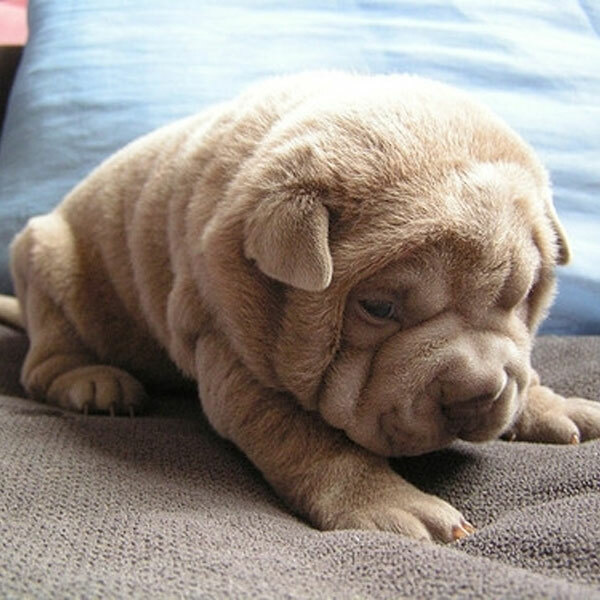 Born with more wrinkles and folds than you could massage in a day, Shar-Pei puppies eventually grow into all that skin. They’re sort of like puppy balloons! 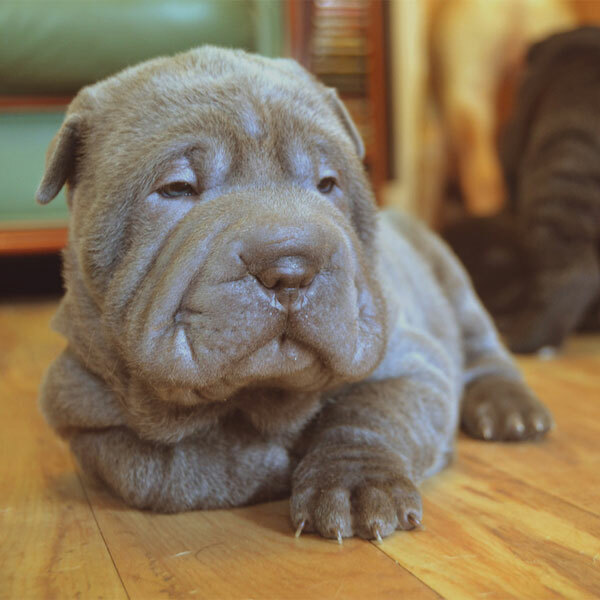 They may look sleepy around the clock, and being inundated by all those glorious folds of skin may contribute to that impression, but Shar-Pei puppies are engaging, loyal, and affectionate. These Shar-Pei puppy pictures will give you cause to rethink the value of wrinkles! 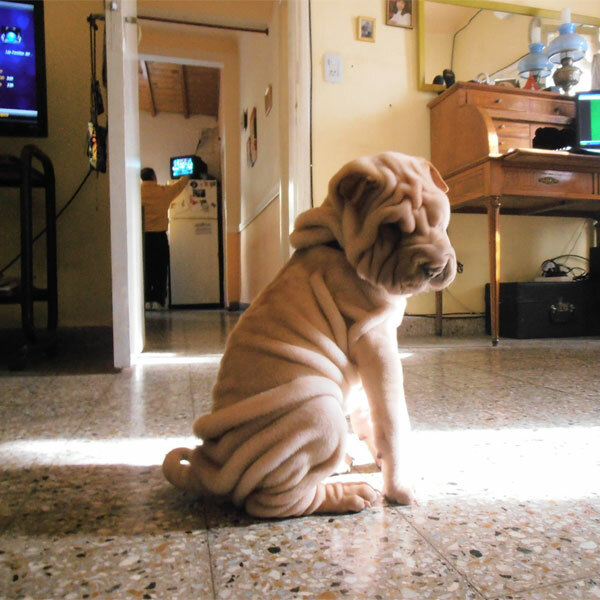 If anything, all those delightful folds and wrinkles make pictures of Shar-Pei puppies resemble works of fine art. The decadent, flowing robes and gowns designed by all the Pre-Raphaelite painters combined cannot hold a candle to a photo of a wrinkly Shar-Pei puppy. Meet Frodo, a Shar-Pei puppy living in Buenos Aires, Argentina. Look how the light and shade in the room draw the focus to the cascading folds. Delightful! 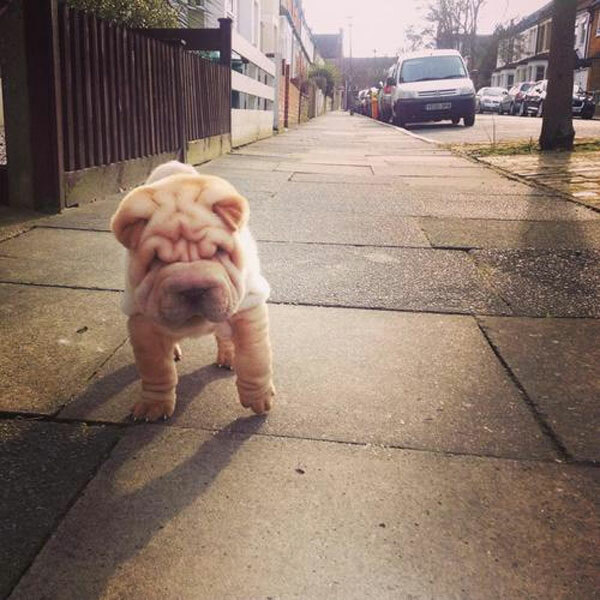 Frodo the Shar-Pei puppy looks like he’s ready for adventure! Shar-Pei puppies are known to get bored easily; while they are said to do well as companions to apartment dwellers, they are just like any other breed, and require exercise. This Shar-Pei puppy is taking his first steps into a larger, brighter world. The tenuous, awkward steps of Shar-Pei puppies are the foundations upon which bold, proud Shar-Pei dogs are built. Painterly wrinkles? Yes, but also statuesque. Filling out those folds requires physical exertion! Regular activity is a must for Shar-Pei puppies, to be sure, but what would a survey of cute puppy pictures be without the darling sight of these tiny little friends at rest? MuMu here resembles nothing quite so much as an adorable bean-bag chair, or a loveable Jabba the Hutt. No pillows or sailing barge cushions required for this Shar-Pei puppy, who has found ample nap-time padding among all those folds and wrinkles! 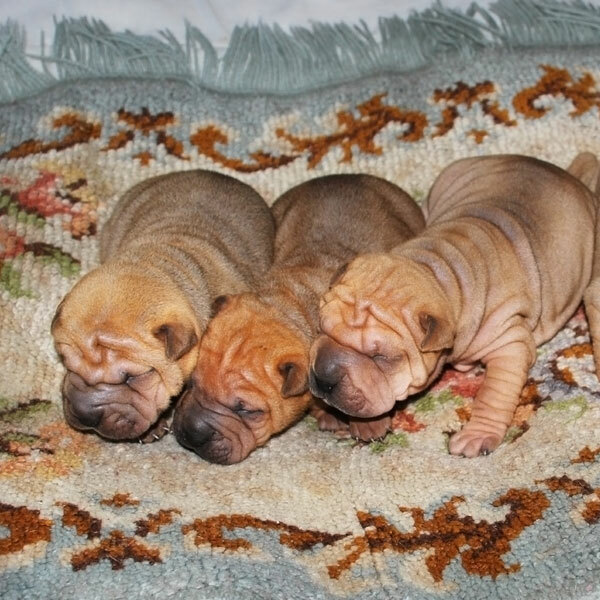 Don’t you just want to cuddle up next to these Shar-Pei puppies? As far as I can tell, this little one’s name is Chocolate, and there’s really nothing sweeter than finding Chocolate asleep in a bin that’s just big enough! 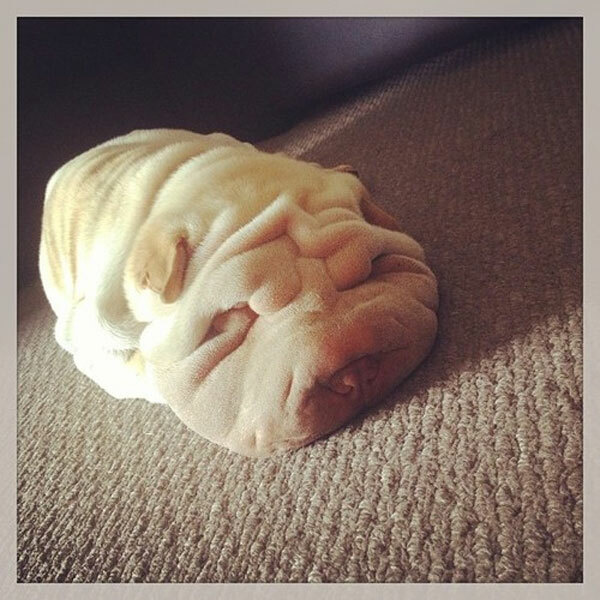 I cannot help but squeak at the sight of all those wrinkles! I’m so pleased to share these Shar-Pei puppies with you all, and hope you’re sharing them with everyone around you! Chocolate found a nice little bin to sleep in! Time to wake up and enjoy a lazy afternoon with our next two Shar-Pei puppies. “Wait a moment,” I hear you saying, “This isn’t a Shar-Pei puppy! Surely, with that snout, it must be a sea cow, manatee, or a dugong!” No, I can assure you that Kona is a Shar-Pei. Look at the long, blue-black tongue and that happy, smiling face! Grab the ball in the background and let’s see if Kona wants to play! Shar-Pei puppies appeal to us for many reasons. I’ve noted their resemblance to works of art, and surely, the striking, solid colors of the coats in these cute puppy pictures contribute to that impression. 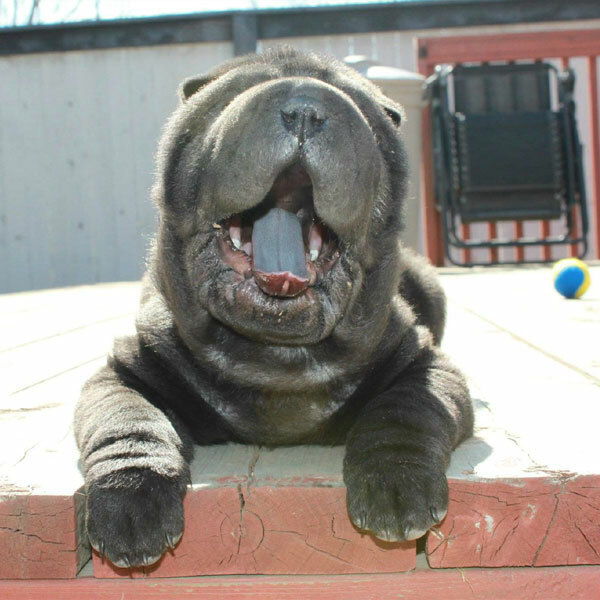 Like works of art that are meant to last, the long-term health of Shar-Pei puppies depends on regular maintenance. All the folds and wrinkles of Shar-Pei puppies require cleaning and upkeep to keep those frowny little faces looking brighter than sunflowers. I don’t know about you, but I feel an instinctive love and attachment to these Shar-Pei puppies. Alone, they inspire sighs of adoration and joy. To see them playing, huddling, and sharing affectionate moments with little friends makes my head spin. These two Shar-Pei puppies will certainly be best pals forever, and that’s a comforting thought. These Shar-Pei puppies are the very best of friends! Are two Shar-Pei puppies not enough for you? How about three baby Shar-Peis huddled together for warmth after a nice meal? At just about one month old, these Shar-Pei puppies’ eyes are only beginning to permit light to enter. They are able to see for the first time and are getting acquainted with each other. Do Shar-Pei puppies worry or fret about wrinkles? Not a whit! For the first few weeks of life, these tiny babies’ biggest concern is trying to figure out which folds belong to which puppy! The only thing better than a cute Shar-Pei puppy is a litter of them! The last of our last Shar-Pei puppy pictures is, without doubt, the most wonderful. Why are we so drawn to cute puppy pictures? Why does the very thought of puppies make us feel warm, accepted, and cared for? 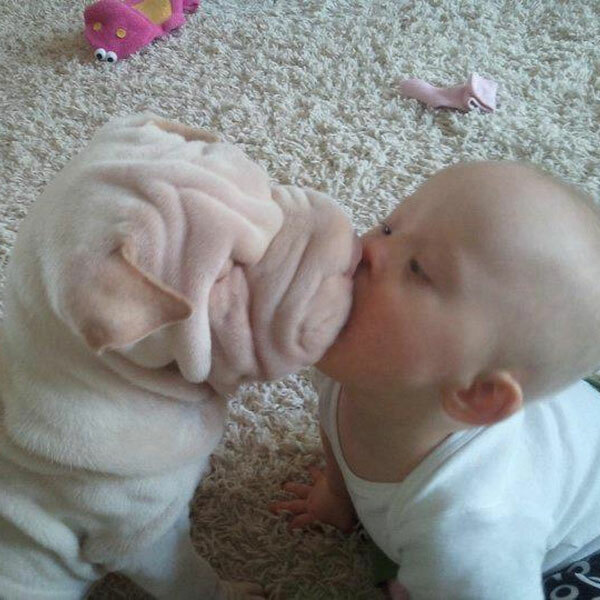 I think we associate babies of all kinds with gentleness, innocence, and love. Our relationships with dogs are among the strongest bonds we experience. What happens when a human baby befriends a Shar-Pei puppy? Magic. Pictures this cute should be banned by law. Thankfully, they’re not! We may never quite reconcile ourselves to the lines and wrinkles that accompany aging, but Shar-Pei puppy pictures never fail to inspire tender feelings. 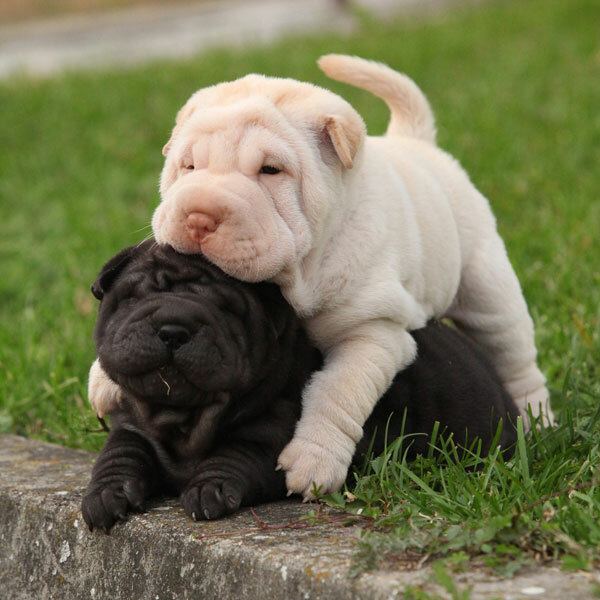 Have you lived with or enjoyed the company of Shar-Pei puppies or dogs? We’d love to read about your memories and experiences with Shar-Peis! Share your stories and photos in the comments!